This delicious recipe has been provided courtesy of Keanon’s Kitchen – a private chef and catering company based in Strandfontein Village, Cape Town. Keanon has been a chef for the past 18 years and has achieved a lot through his sheer passion, persistence and ambition. After completing his matric year, Keanon completed a national diploma in catering and hospitality studies. Starting in hotels, Keanon has worked his way through the ranks of the kitchen. In 2011 he was chosen as an inflight chef for Etihad airways, based in Abu Dhabi. He was responsible for wining and dining prestigious V.I.P guests in first class. He has cooked for the likes of Sir Paul McCartney, Coldplay and many of the royal family in Abu Dhabi. You can visit his Facebook page and Instagram page for more information. Swordfish has a wonderfully meaty texture being moist and fairly sweet in flavour. Swordfish is among the few natural food sources of vitamin D. It’s also an excellent source of protein and selenium. Selenium can improve bone health by adding strength and durability. The mineral also strengthens the teeth, hair, and nails. In South Africa, swordfish is targeted by the tuna/swordfish longline fishery. The stock status is healthy in the Atlantic, although it is believed to be overexploited in the North Atlantic Indian Ocean. The Tuna/Swordfish fishery is managed by a Total Allowable Effort (TAE), meaning that instead of setting a limit on the catch, a limit is set on the number of rights holders allowed to catch tuna. Currently there is a limit of 200 rights holders in SA (including pole and longline). In addition to this effort limitation, ICCAT has allocated a TAC of 1200 tonnes for SA swordfish catches. 3 – 4 portions of 180g to 200g fresh sword fish fillets clean and patted dry. In a medium sauce pan, sauté onions and celery on a low to medium heat. Add all the wine and allow all the wine to cook away. Turn heat to low and add 1 ladle at a time of the stock; allow stock to cook away before adding the next ladle. Continue till all stock is added and cook until rice is tender. Remove from heat and add seasoning, lemon zest, spring onion, butter, cheese and serve. Season sword fish with salt and pepper, rub with olive oil and gently massage seasoning into fish. In a medium to large thick based or non-stick pan heat remaining oil ensure the oil is hot before gently placing each piece of fish in the pan. Allow each piece of fish to get a beautiful sear, turn after 30 – 40 seconds each side. REMEMBER NO COLOUR MEANS NO FLAVOUR. 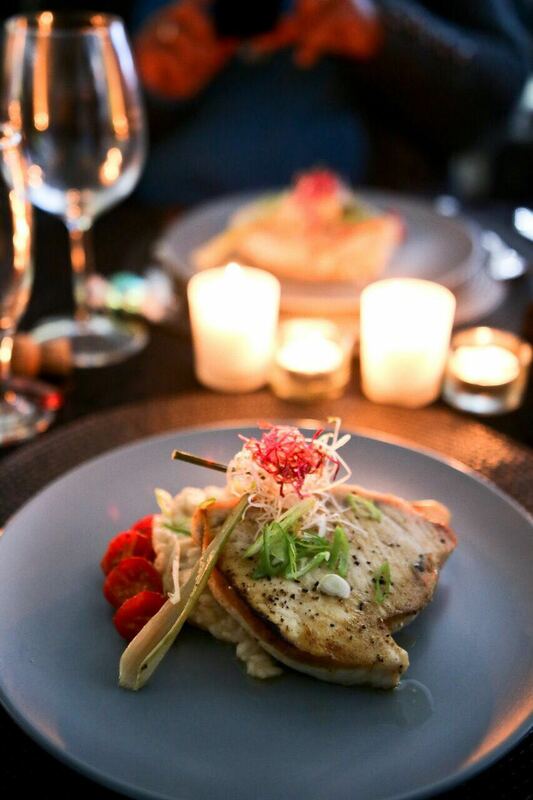 Set seared fish on top of risotto, served with oven roasted baby fennel and oven roasted halved cherry tomatoes.